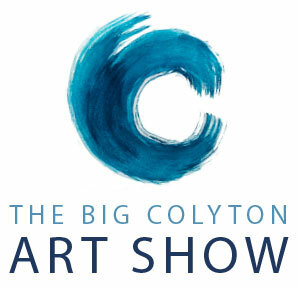 We are delighted to report that the second Big Colyton Art Show was a resounding success, raising approximately £12,000 for Colyton Grammar School’s Space4Science appeal, towards vital additional science facilities at the school. This fantastic fund raising event took place over two days, 15th and 16th October 2016, and featured artworks by a selection of the finest artists, jewellers, ceramicists, sculptors and glassmakers from across the region, as well as an imaginative and innovative selection of GCSE and A level artwork from students studying with Colyton Grammar School’s excellent art department. Once again, the excellent cafe proved hugely popular, while the shop selling cards and smaller items was very successful, almost selling out of the Christmas decorations created by sixth form students. We are so grateful to everybody who contributed towards making this such a successful and enjoyable event, especially to our enthusiastic and generous Patron, internationally acclaimed artist Charlie O’Sullivan, and are already looking forward to planning the next Big Colyton Art Show in 2018 – watch this space!